Impressionism is “real” enough to be recognizable by students. Yet it is different enough that it clearly challenges the viewer to think differently, to adopt a different perspective. At least for me, it’s the most approachable type of art. I understand the break they are making with tradition and I am persuaded by the esthetics they create. It is challenging enough to freeze me into contemplation but familiar enough to be comfortable. It is also something students can emulate easily. I have seen amazing versions of Starry Night and Vase with Twelve Sunflowers done by preschoolers at my wife’s school. 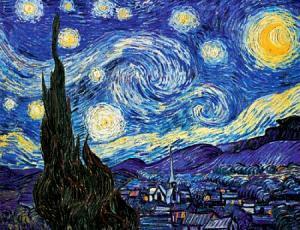 A room filled with Starry Nights done by 4 year olds is breathtaking. The area I would move gingerly as a teacher is contemporary art. I cannot help feeling that much of it is a joke at my expense and I remember deep resentment when I was exposed to it in the 70’s. This leads to two thoughts: One, when presenting modern art it is critical to create a cultural context, an understanding of the process of art in all it’s glory, human flaws, economic aspects, and experimentation. Second, and more important, we each (and our students each) need to be allowed to find value where we do. If we don’t, we risk ending up like Mr. Karp in A Chorus Line. We can only encourage students to explore the possibilities of art, not impose our meanings (or even expectations) on them.